You must meet all of the eligibility criteria to participate in the Telecommunications Access Program (TAP). Current applications are required for each individual applying for equipment. To have an application mailed to your home, please complete and submit the online TAP request form. Once received, fill out the application completely. To get your equipment faster, fill in all the fields on the application and answer all of the questions. If you need assistance, contact us at (800) 372-2907. Complete the "Professional Certification" section of the application. Take the application to one of the professionals listed below and they will complete that section of the form. Director of a public or private agency serving deaf, hard of hearing, speech impaired or deaf-blind consumers. The agency must have prior approval from KCDHH before they can become authorized to “certify” applications. Attach a copy of your phone bill. Include the section of your phone bill that shows your name, address and phone number as listed on your application. If you do not have a recent bill, or you do not receive a hardcopy bill, call your phone company and request a copy for verification purposes. If your name is not on the phone bill submitted, then provide a copy of identification, such as a driver's license, auto registration, Social Security letter or other state or federal identification showing the same address listed on the application. Provide proof of residency. On the front page of the application list how long you have lived in Kentucky and sign the “Statement of Understanding" section of the application. Wireless applicants must submit a copy of a valid Kentucky driver’s license or other state or federal identification to receive equipment. Equipment selection. Pick the piece of equipment you want to receive from those listed on the insert included with the application. You may select a signaling device as well as one piece of telephone equipment. Consult your professional to select the correct equipment as it cannot be exchanged once distributed. Get additional verification, if necessary. If you are deaf, hard of hearing, speech impaired and blind or visually impaired, your application will require additional certification regarding your vision impairment for some pieces of equipment. 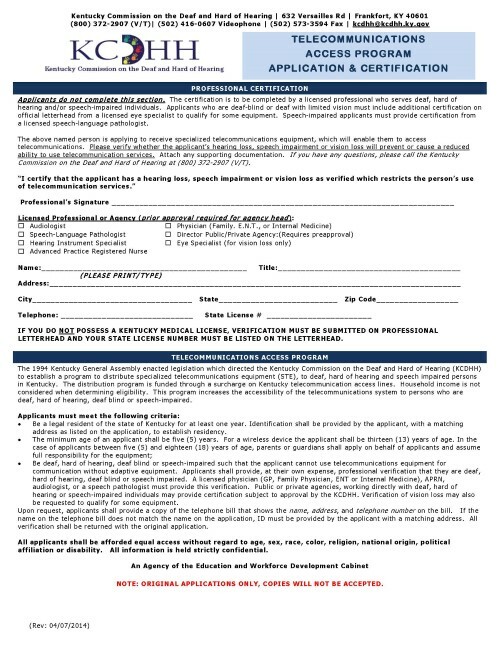 Obtain a letter on official letterhead including the name, address, telephone number, license number and signature of the licensed professional. If you are applying for a Braille device you must also get certification of your ability to type and read Braille. 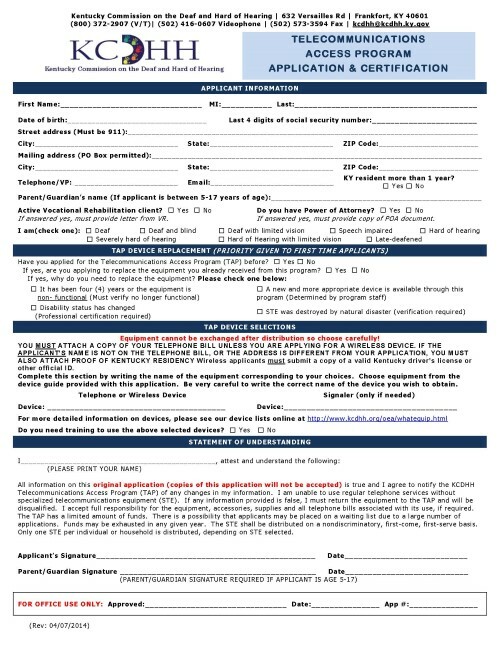 SIGN your name on the bottom of the first page (if this is your first time applying, be sure a professional signed at the bottom of the second page) and submit your completed application. Below is an example of the brochure you will receive in the mail or can pick up at the KCDHH office in Frankfort. Please read this brochure in full before completing the TAP application which will be enclosed with the brochure (see images below). This will give you an idea of what needs to be filled out and submitted to the office to become eligible for a specialized telephone or wireless device to meet your unique communication needs. Contact us if you have questions at (800) 372-2907 or on VP at (502) 416-0607. Note: This is a sample brochure only and it may not reflect the current edition exactly. To view/download the most up to date brochure, please visit the Equipment List page.